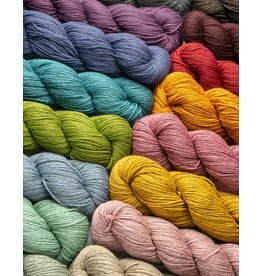 June Cashmere yarns are made by sustainably sourcing cashmere directly from small family farms in Kyrgyzstan, Central Asia. June Cashmere's 100% cashmere fiber is collected directly from Kyrgyz shepherds living on small family farms along the ancient Silk Road amidst the soaring mountains of Central Asia. June is the Kyrgyz word for animal fiber, which is a centuries old vital resource and essential element of their nomadic lifestyle. From felted woolen rugs, to the clothes on their backs, june has made itself an indelible part of Kyrgyz culture. Additionally, the uniquely warm properties of the cashmere from their goats allow them to sustain cold and long winters in the vast mountains in Kyrgyzstan. 100% cashmere sustainably sourced from small family farms in Kyrgyzstan, Central Asia. Gathered in Kyrgyzstan, processed by artisans in Europe, finished in Maine, USA. In its natural color, unbleached.